This gift set contains three monovarietal oils produced on the first day of harvest. The three protagonists of this year's set are the Arbequina Hare, the Arbosana Duck, and the the Picual Partridge from Cortijo el Puerto's Granja collection. This "micro farm" of oils includes tasting notes and food pairings for each oil, making this an ideal set for tasting, to give to friends and family, or keep for yourself and take them anywhere. Arbequina: Produced from 100% organic Arbequina olives, this medium intensity oil has a delicate floral aroma with notes of freshly cut grass, banana and green almond. The banana continues with also a taste of green apple on the palate, then a slight bitterness and peppery kick of pungency persists to the balanced finish. Arbosana: Produced from 100% organic Arbosana olives, this oil is noted for its fresh and clean aroma. Harvested when green, the oil has a medium robust character, with an aroma of freshly cut grass, banana, tomato, green almond, artichoke and citrus. On the palate it offers hints of olive leaf, green banana and licorice. The complex flavors find balance with the oil's bitterness and its intense and persistent peppery kick. 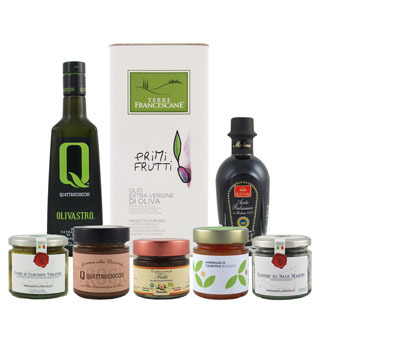 Picudo: Produced from 100% organic Picudo extra virgin olive oil, the oil carries myriad aromas from across the farm, like grass, tomato, green bean, almond, and wildflowers. On the palate the fruity green oil offers flavors of banana and even coffee before finding a balance of bitter and spicy notes at the finish.